This section will give a brief overview of the known network and look in a little more detail at gaps in this network and also at references to Roman roads in the antiquarian literature. The Abbey of Neubotle, founded in 1164 near Dalkeith, just south of Edinburgh, was given a grant of land of what is now known as the Monklands, near Airdrie. They successfully reared sheep and grain on the land and engaged in coal mining. To help move their produce they are said to have built a road to the Monklands. 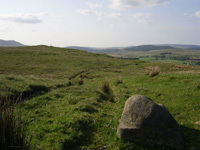 As they negotiated rights of way with landowners, we can trace its approximate course. Older Ordnance Survey maps show a Roman road running south from Ayr to just beyond Dalmellington. It then continues as a "Pack Road" towards Carsphairn and Dalry. We trace the course taken by this road and look at why it might have been built. In mediaeval times abbeys and other religious houses received grants of land where they conducted activities like farming and mining. They kept a record of these lands in their chartularies and these frequently mention roads. This section explores these charters and tries to identify the roads they refer to. George Chalmers (1742-1825 ) was an eminent Scottish historian who wrote a major work on the history of Scotland, titled Caledonia. The work contains some useful references to roads, both historical and contemporary with his times. Details of these are given with links to the original volumes on the Internet Archives. Walter MacFarlane was an antiquarian who collected a wide range of materials relating to Scotland. Among these, the Geographical Collections consist of accounts of the topography, history and antiquities for many parishes and districts in Scotland. There are many references to roads, bridges, fords and ferries dating mostly from the 1720's but with some from the 1600's which provide valuable clues for the reconstruction of the road network of the time. The early burghs of Ayr and Rutherglen were allowed to levy tolls on goods before these could be traded in their respective jurisdictions. The names of the locations where these tolls were raised or that defined a trade precinct provide useful clues to routes in west and central Scotland in the early middle ages. These roads were built in the 1700's to ensure that government troops could deploy easily to strategic locations in the Highlands in the event of a Jacobite uprising. Over 250 miles of road were built by General Wade, and some 800 miles by his less well-known successor, Major Caulfeild. There was also a road from Carlisle to Portpatrick to allow easy access to Ireland.